There's a memory leak in the latest version of the Media Buttons. I am pretty sure I never noticed this in the previous version. Killing the process has no effects. It restarts and after one hour it's using 2GB+ memory. The discussion is now public. Yes, it really looks like memory leak. Could you, please, provide more info: your OS version and screenshot of VOX Preferences to see configuration, we will try to reproduce this issue. 1. open VOX Preferences and uncheck top 3 checkboxes (Use keyboard media buttons, Use headphones controls, Use remote controls), this will force VOX Media Buttons process to quit. 2. Remove VOX Preferences, install it again and turn on checkboxes back, VOX Media Button process will be started. This will insure that really the latest version of VOX Media Buttons is launched. Because specially in last version we've made some improvements to avoid memory leaks, so it's strange you face such problem in this version. Sorry for the inconvenience. We are investigating this further and new update is about to be released. You can disable or remove the extension for now, to keep your RAM free. Awaiting more comments from you about next version. Thanks for helping us in this matter. 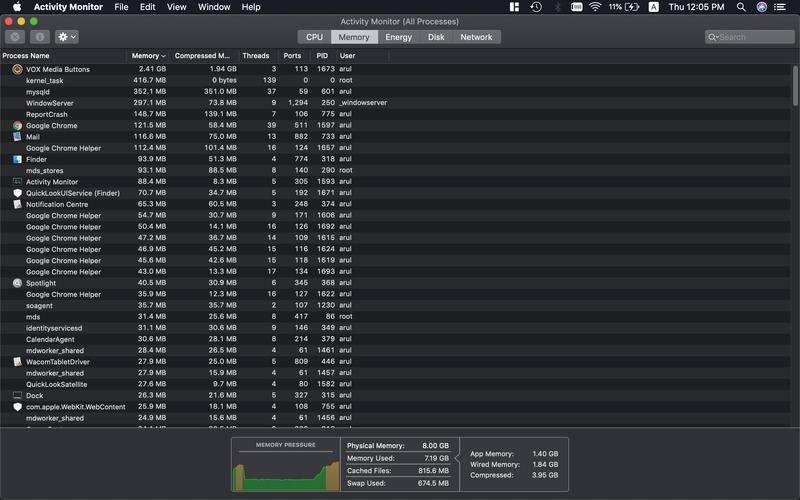 I am experiencing the same issue after Mojave upgrade. Mediabuttons consume about 2.3 GB of RAM. See the attached screenshot. We are sorry about all mentioned above, this notifications are already passed to dev. team. Currently, we suggest removing Vox Preferences to stop memory leak, while we developing a fix for VOX Preferences. This is f@#%ing crazy! VOX loads 95% of CPU and if I kill process it starts again immediately! Even if I delete VOX from Applications folder. How to stop this? Can not use my Mac! If the crazy memory leak is connected with VOX Media Buttons process (you can check it via ActivityMonitor), we suggest removing Vox Preferences, before a new version of the extension is released. Please take a look at the post above. Hi, Icannot remove Vox preferences because I don’t have a clue where it is in my mac. Finder wont find it. System says Vox Media buttons is eating 8gb my memory. Help me! 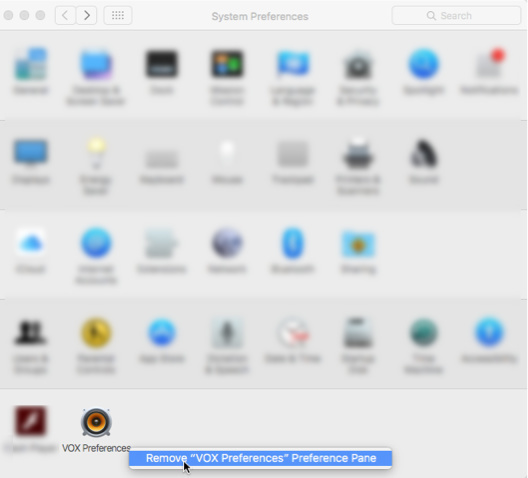 Go to System Preference…> Find VOX Preferences. Remove them by clicking with a right mouth click and choosing remove option. I upgraded to Mojave and instantly my Macbook began running hot (I actually heard a fan, for the first time ever) and memory began vanishing. I use Memory Clean, and it was constantly activating. The activity monitor showed that it was the Vox Media Buttons which were ‘leaking’ only in the sense that the Titanic suffered from a leak. 1·5 Gb in five minutes. Have disabled Vox until things pick up. Thank you for this advice, it’s the main thing that that has given me my Macbook back after what was turning into a very regrettable upgrade (Mojave). Have you updated media buttons to correct work at Mac? We got some good news - VOX Media Buttons has a fresh update! Go to “System Preferences” > “VOX Preferences” and press Check for Updates!